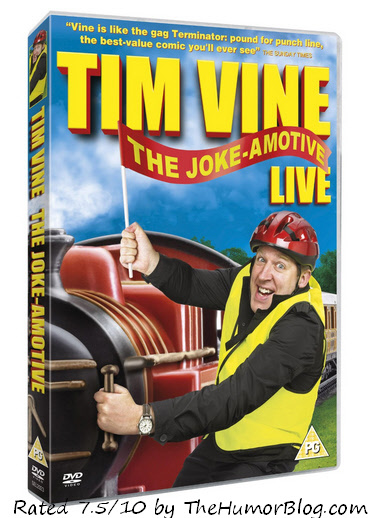 The one-line master is back with another DVD, it is from his latest tour ‘Joke-amotive’. His previous releases have been well received, so how do this one do? I pop the DVD in and the menu quickly loads up, it feels like a kids program. Very cheesy graphics with corny background music, this is certainly a Tim Vine creation! The set follows on the corniness, carrying on the theme, it looks good though, a small but interesting set. He opens with a funny song, as he brings us all aboard the punaway train. This is definitely like something from a kids show! Through-out the performance the catchy songs reappear, often completely random and pointless, which is what makes this style of comedy funny. As for his one-liners – he throws them out a great speed! Even take a sip of your drink and you can find you miss a gag. His jokes are aided with lots of stage props also. Some of his jokes I found myself literally with my head in my hands saying “oh my god, that joke is so bad”, the sort of one-liner your dad would come out with at a party. But somehow I still chuckle. Plenty of other gags though are genuinely good and I felt more respectable and comfortable with myself for laughing at them! I have no idea how many jokes he told in total in this performance, but I know it was a huge amount. No random shouts from the audience, or any kind of heckling in this gig, not that sort of performance. If you are after something fun and harmless for a laugh, perhaps around Christmas, this is ideal for all the family (it is only classified PG so is safe for all ages). On the DVD you do also get a few extras, which include 3 short-flims made by Vine, their is also a tour movie and another song from the gig not in the main feature. This certainly won’t be everyone’s cup of tea. If you like edgy comedy about adult subjects this certainly won’t be for you, the fact it’s a PG says it all. But if you are after some family-friendly fun and are a fan of one-liners you will love this. And with some many gags this is good value for money. I rate it 7.5/10. My name is Tim so I’ll surely check him out.